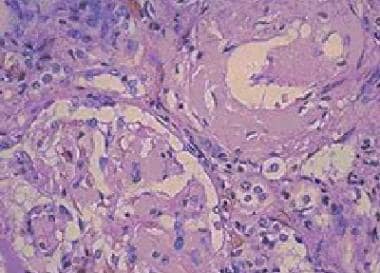 Amorphous eosinophilic interstitial amyloid observed on a renal biopsy. Congo red staining of a cardiac biopsy specimen containing amyloid, viewed under polarized light. All types of amyloid consist of one major fibrillar protein that defines the type of amyloid. Polymorphisms that slightly vary native peptides or inflammatory processes set the stage for abnormal protein folding and amyloid fibril deposition. Many classic eponymic diseases were later found to be related to a diverse array of misfolded polypeptides (amyloid) that contain the common beta-pleated sheet architecture. For patient education information, see the Brain and Nervous System Center, as well as Mad Cow Disease and Variant Creutzfeldt-Jakob Disease. Historical classification systems for amyloidosis were clinically based. Modern classification systems are biochemically based. Until the early 1970s, the idea of a single amyloid substance predominated. Various descriptive classification systems were proposed based on the organ distribution of amyloid deposits and clinical findings. Most classification systems included primary (ie, in the sense of idiopathic) amyloidosis, in which no associated clinical condition was identified, and secondary amyloidosis, which is associated with chronic inflammatory conditions. Some classification systems included myeloma-associated, familial, and localized amyloidosis. The modern era of amyloidosis classification began in the late 1960s with the development of methods to solubilize amyloid fibrils. These methods permitted chemical amyloid studies. Descriptive terms such as primary amyloidosis, secondary amyloidosis, and others (eg, senile amyloidosis), which are not based on etiology, provide little useful information and are no longer recommended. Similarly, in most cases previously termed senile cardiac amyloidosis and in many cases previously termed familial amyloid polyneuropathy (FAP), the fibrils consist of the transport protein transthyretin (TTR); these diseases are now collectively termed ATTR. Proteins that form amyloid fibrils differ in size, function, amino acid sequence, and native structure but become insoluble aggregates that are similar in structure and properties. Protein misfolding results in the formation of fibrils that show a common beta-sheet pattern on x-ray diffraction. In theory, misfolded amyloid proteins can be attributed to infectious sources (prions), de novo gene mutations, errors in transcription, errors in translation, errors in post-translational modification, or protein transport. For example, in ATTR, 100 different points of single mutations, double mutations, or deletions in the TTR gene and several different phenotypes of FAP have been documented. Twenty-three different fibril proteins are described in human amyloidosis, with variable clinical features. The precursor protein is a normal-sequence apo-SAA (serum amyloid A protein) now called "A", which is an acute phase reactant produced mainly in the liver in response to multiple cytokines. "A" protein circulates in the serum bound to high-density lipoprotein. Therapy has traditionally been aimed at the underlying inflammatory condition to reduce the production of the precursor amyloid protein, SAA. Disease-modifying antirheumatic drugs (DMARDs) such as colchicine, a microtubule inhibitor and weak immunosuppressant, can prevent secondary renal failure due to amyloid deposition specifically in familial Mediterranean fever. Newer therapies have become more targeted to avoid the cytotoxicity of older agents (eg, chlorambucil, cyclophosphamide). The SAA amyloid seen in CAPS was reduced with a biologic interleukin (IL)–1β trap called rilonacept. The precursor protein is a clonal immunoglobulin light chain or light chain fragment. AL is a monoclonal plasma cell disorder closely related to multiple myeloma, as some patients fulfill diagnostic criteria for multiple myeloma. Typical organs involved include the heart, kidney, peripheral nervous system, gastrointestinal tract, respiratory tract, and nearly any other organ. AL includes former designations of primary amyloidosis and myeloma-associated amyloidosis. Treatment usually mirrors the management of multiple myeloma (ie, chemotherapy). Selected patients have received benefit from high-dose melphalan and autologous stem-cell transplantation, with reports of prolonged survival in some studies. For more information, see Immunoglobulin-Related Amyloidosis. Point mutations in TTR increase the tendency of TTR to form amyloid. Amyloidogenic TTR mutations are inherited as an autosomal dominant disease with variable penetrance. More than 100 amyloidogenic TTR mutations are known, but many remain unknown. The most prevalent TTR mutations are TTR Val30Met (common in Portugal, Japan, and Sweden), and TTR Val122Ile (carried by 3.9% of African Americans). Treatment for mutant-sequence amyloidogenic ATTR is liver transplantation or supportive care. Liver transplantation should be performed in Val30Met patients as early as possible as it removes the main source of mutant TTR and dramatically reduces the progression of neuropathy (up to 70%) and can double the median survival. The US Food and Drug Administration (FDA) has not approved any pharmacological treatments for ATTR, but tafamidis, diflunisal, patisiran, revusiran, and tolcapone have demonstrated some benefit. For normal-sequence amyloidogenic ATTR, the treatment is supportive care. For details, see Transthyretin-Related Amyloidosis. The precursor protein is a normal beta2 -microglobulin (β2 M), which is the light-chain component of the major histocompatibility complex (MHC). In the clinical setting, β2 M is associated with patients on dialysis and, rarely, patients with renal failure who are not on dialysis. β2 M is normally catabolized in the kidney after it is displaced from the MHC-I heavy chain in the proximal tubules, but in patients with decreased clearance the serum level of the β2 M can be more than 60 times the normal level. In patients with renal failure, the protein accumulates in the serum, leading to secondary osteoarticular destruction and dialysis-related amyloidosis (DRA). Aβ2 M commonly is associated with deposits in the carpal ligaments, synovium, and bone, resulting in carpal tunnel syndrome, destructive arthropathy, bone cysts, and fractures. Other organs involved include the heart, gastrointestinal tract, liver, lungs, prostate, adrenals, and tongue. Treatment also includes renal transplantation, which may arrest amyloid progression. For details, see Dialysis-Related Beta-2m Amyloidosis. These disorders are typically associated with heterozygous mutations in the NLRP3 (CIAS1) gene, which encodes the cryopyrin (NALP3) protein, and are inherited in an autosomal dominant manner. The inflammation in CAPS is driven by excessive release of interleukin (IL)–1β. IL-1β release is normally regulated by an intracellular protein complex known as the inflammasome that maps to a gene sequence called NLRP3. Mutations in NLRP3 may cause an aberrant cryopyrin protein inside the inflammasome, leading to the release of too much IL-1β and subsequent multisystem inflammation. Canakinumab is a competing human immunoglobulin G (IgG) monoclonal antibody that also targets IL-1β and has shown efficacy in autoinflammatory conditions that, if untreated, are fatal by age 20 years in about 20% of individuals. Both agents have the potential to cause infections, but they are usually mild and treatable. For details, see Familial Renal Amyloidosis. Apolipoprotein AI amyloidosis (apoAI) is an autosomal dominant amyloidosis caused by point mutations in the apoAI gene. Usually, this amyloidosis is a prominent renal amyloid but can also form in many locations. ApoAI (likely of normal sequence) is the fibril precursor in localized amyloid plaques in the aortae of elderly people. ApoAI can present either as a nonhereditary form with wild-type protein deposits in atherosclerotic plaques or as a hereditary form due to germline mutations in the apoA1 gene. Currently, more than 50 apoAI variants are known and 13 are associated with amyloidosis. As more gene locations are found, the clinical phenotypes are slowly being elucidated. Lysozyme amyloidosis (ALys) is an autosomal dominant amyloidosis caused by point mutations in the lysozyme gene. Apolipoprotein AII amyloidosis (AapoAII) is an autosomal dominant amyloidosis caused by point mutations in the apoAII gene. The 2 kindreds described with this disorder have each carried a point mutation in the stop codon, leading to production of an abnormally long protein. Alzheimer disease has a normal-sequence protein, except in some cases of familial Alzheimer disease, in which mutant beta protein is inherited in an autosomal dominant manner. Down syndrome has a normal-sequence protein that forms amyloids in most patients by the fifth decade of life. Hereditary cerebral hemorrhage with amyloidosis (HCHWA), Dutch type, is inherited in an autosomal dominant manner. The beta protein contains a point mutation. These patients typically present with cerebral hemorrhage followed by dementia. The precursor protein in APrP is a prion protein, which is a plasma membrane glycoprotein. The etiology is either infectious (ie, kuru) and transmissible spongiform encephalitis (TSE) or genetic (ie, Creutzfeldt-Jakob disease [CJD], Gerstmann-Sträussler-Scheinker [GSS] syndrome, fatal familial insomnia [FFI]). The infectious prion protein is a homologous protein encoded by a host chromosomal gene, which induces a conformational change in a native protease-sensitive protein, increasing the content of beta-pleated sheets. The accumulation of these beta-pleated sheets renders the protein protease-resistant and therefore amyloidogenic. Patients with TSE, CJD, GSS, and FFI carry autosomal dominant amyloidogenic mutations in the prion protein gene; therefore, the amyloidosis forms even in the absence of an infectious trigger. Similar infectious animal disorders include scrapie in sheep and goats and bovine spongiform encephalitis (ie, mad cow disease). The precursor protein in cystatin C amyloidosis (ACys) is cystatin C, which is a cysteine protease inhibitor that contains a point mutation. This condition is clinically termed HCHWA, Icelandic type. ACys is autosomal dominant. Clinical presentation includes multiple strokes and mental status changes beginning in the second or third decade of life. Many of the patients die by age 40 years. This disease is documented in a 7-generation pedigree in northwest Iceland. The pathogenesis is one of mutant cystatin that is widely distributed in tissues, but fibrils form only in the cerebral vessels; therefore, local conditions must play a role in fibril formation. Two syndromes (British and Danish familial dementia) that share many aspects of clinical Alzheimer disease have been identified. Findings include the presence of neurofibrillary tangles, parenchymal preamyloid and amyloid deposits, cerebral amyloid angiopathy, and amyloid-associated proteins. Both conditions have been linked to specific mutations on chromosome 13; they cause abnormally long protein products (ABri and ADan) that ultimately result in different amyloid fibrils. Amyloid fibrils include a gelsolin fragment that contains a point mutation. Two amyloidogenic gelsolin mutations are described. "A G654A or G654T DNA mutation in the gelsolin coding area (q32–34) of chromosome 9, which changes an aspartate at position 187 in the gelsolin protein to an asparagine or tyrosine (D187N/Y) residue respectively. These mutations lead to gelsolin fragment formation and amyloidogenesis."  . The precursor protein is atrial natriuretic factor (ANF), a hormone controlling salt and water homeostasis that is synthesized by the cardiac atria. Amyloid deposits are localized to the cardiac atria. This condition is highly prevalent in elderly people and generally is of little clinical significance. ANF amyloidosis (AANF) is most common in patients with long-standing congestive heart failure, presumably because of persistent ANF production. Proper diagnosis requires extensive testing, including paraffin blocks of tissue for molecular typing by liquid chromatography-tandem mass spectrometry and observation of Congo red staining on affected atrial tissues. No known relation exists to the amyloidoses that involve the cardiac ventricles (ie, AL, ATTR). Point mutations occur in a gene termed BIGH3, which encodes keratoepithelin and leads to autosomal dominant corneal dystrophies characterized by the accumulation of corneal amyloid. Some BIGH3 mutations cause amyloid deposits, and others cause nonfibrillar corneal deposits. Another protein, lactoferrin, is also reported as the major fibril protein in familial subepithelial corneal amyloidosis. The relationship between keratoepithelin and lactoferrin in familial corneal amyloidosis is not yet clear. In calcitonin amyloid (ACal), the precursor protein is calcitonin, a calcium regulatory hormone synthesized by the thyroid. Patients with medullary carcinoma of the thyroid may develop localized amyloid deposition in the tumors, consisting of normal-sequence procalcitonin (ACal). The presumed pathogenesis is increased local calcitonin production, leading to a sufficiently high local concentration of the peptide and causing polymerization and fibril formation. Aortic medial amyloid occurs in most people older than 60 years. Medin amyloid (AMed) is derived from a proteolytic fragment of lactadherin, a glycoprotein expressed by mammary epithelium. All types of amyloid deposits contain not only the major fibrillar component (solubility in water, buffers of low ionic strength), but also nonfibrillar components that are soluble in conventional ionic-strength buffers. The role of the minor components in amyloid deposition is not clear. These components do not appear to be absolutely required for fibril formation, but they may enhance fibril formation or stabilize formed fibrils. The nonfibrillar components, contained in all types of amyloid, are discussed below. However, note that other components found in some types of amyloid include complement components, proteases, and membrane constituents. 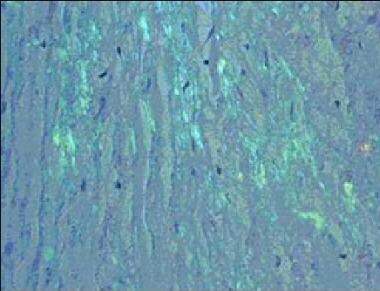 Pentagonal (P) component comprises approximately 5% of the total protein in amyloid deposits. This component is derived from the circulating serum amyloid P (SAP) component, which behaves as an acute-phase reactant. The P component is one of the pentraxin group of proteins, with homology to C-reactive protein. In experimental animals, amyloid deposition is slowed without the P component. Radiolabeled material homes to amyloid deposits; therefore, this component can be used in amyloid scans to localize and quantify amyloidosis and to monitor therapy response. Radiolabeled P component scanning has proven clinically useful in England, where the technology was developed, but it is available in only a few centers worldwide. Apolipoprotein E (apoE) is found in all types of amyloid deposits. One allele, ApoE4, increases the risk for beta protein deposition, which is associated with Alzheimer disease. ApoE4 as a risk factor for other forms of amyloidosis is controversial. The role of apoE in amyloid formation is not known. GAGs are heteropolysaccharides composed of long, unbranched polysaccharides that contain a repeating disaccharide unit. These proteoglycans are basement membrane components intimately associated with all types of tissue amyloid deposits. Amyloidotic organs contain increased amounts of GAGs, which may be tightly bound to amyloid fibrils. Heparan sulfate and dermatan sulfate are the GAGs most often associated with amyloidosis. Heparan sulfate and dermatan sulfate have an unknown role in amyloidogenesis. Studies of A amyloidosis (AA) and light chain amyloidosis (AL) amyloid have shown marked restriction of the heterogeneity of the glycosaminoglycan chains, suggesting that particular subclasses of heparan and dermatan sulfates are involved. Compounds that bind to heparan sulfate proteoglycans (eg, anionic sulfonates) decrease fibril deposition in murine models of AA and have been suggested as potential therapeutic agents. In all forms of amyloidosis, the cell secretes the precursor protein in a soluble form that becomes insoluble at some tissue site, compromising organ function. All the amyloid precursor proteins are relatively small (ie, molecular weights 4000-25,000) and do not share any amino acid sequence homology. The secondary protein structures of most soluble precursor proteins (except for SAA and chromosomal prion protein [Prpc]) have substantial beta-pleated sheet structure, while extensive beta-sheet structure occurs in all of the deposited fibrils. In some cases, hereditary abnormalities (primarily point mutations or polymorphisms) in the precursor proteins are present (eg, lysozyme, fibrinogen, cystatin C, gelsolin). In other cases, fibrils form from normal-sequence molecules (eg, AL, β2 M). In other cases, normal-sequence proteins can form amyloid, but mutations underlying inflammatory milieu accelerate the process (eg, TTR, beta protein precursor or CAPS). In localized amyloidoses, the deposits form close to the precursor synthesis site; however, in systemic amyloidoses, the deposits may form either locally or at a distance from the precursor-producing cells. Amyloid deposits primarily are extracellular, but reports exist of fibrillar structures within macrophages and plasma cells. In some types of amyloidosis (eg, always in AA, often in AL and ATTR), the amyloid precursors undergo proteolysis, which may enhance folding into an amyloidogenic structural intermediate. In addition, some of the amyloidoses may have a normal proteolytic process that is disturbed, yielding a high concentration of an amyloidogenic intermediate. For example, it was shown that the mast cells of allergic responses may also participate in the development of secondary or amyloid AA in chronic inflammatory conditions. Mast cells hasten the partial degradation of the SAA protein that can produce highly amyloidogenic N-terminal fragments of SAA. However, factors that lead to different organ tropisms for the different amyloidoses are still largely unknown. Whether the proteolysis occurs before or after tissue deposition is unclear in patients in whom beta protein fragments are observed in tissue deposits. In some types of amyloid (eg, AL, Aβ, ATTR), nonfibrillar forms of the same molecules can accumulate before fibril formation; thus, nonfibrillar deposits, in some cases, may represent intermediate deposition. Amyloidosis is diagnosed when Congo red–binding material is demonstrated in a biopsy specimen. Because different types of amyloidosis require different approaches to treatment, determining only that a patient has a diagnosis of amyloidosis is no longer adequate. A clinical situation may suggest the type of amyloidosis, but the diagnosis generally must be confirmed by immunostaining a biopsy specimen. Antibodies against the major amyloid fibril precursors are commercially available. For example, AL, ATTR, and Aβ2 M can present as carpal tunnel syndrome or gastrointestinal amyloidosis, but each has a different etiology and requires a different treatment approach. Similarly, determining whether the amyloid is of the AL or ATTR type is often difficult in patients with cardiac amyloidosis, because the clinical picture usually is similar. Without immunostaining to identify the type of deposited protein, an incorrect diagnosis can lead to ineffective and, perhaps, harmful treatment. Be wary of drawing diagnostic conclusions from indirect tests (eg, monoclonal serum proteins) because the results of these presumptive diagnostic tests can be misleading; for example, monoclonal serum immunoglobulins are common in patients older than 70 years, but the most common form of cardiac amyloidosis is derived from TTR. For many years, rectal biopsy was the first procedure of choice. An important clinical advance was the recognition that the capillaries in the subcutaneous fat are often involved in patients with systemic amyloidosis and can often provide sufficient tissue for the diagnosis of amyloid, immunostaining, and, in some cases, amino acid sequence analysis; thus, biopsy of the organ with the most severe clinical involvement is often unnecessary. For example, in cardiac amyloidosis, the definitive diagnosis of the type of amyloid can be made using an endomyocardial biopsy specimen, with Congo red and immunologic staining of the tissue sample. Alternatively, when noninvasive testing suggests cardiac amyloidosis, studying a subcutaneous fat aspiration instead of endomyocardial biopsy, thereby avoiding an invasive procedure, often provides a specific diagnosis. When the subcutaneous fat aspiration biopsy (the least invasive biopsy site) does not provide information to reach a firm diagnosis, biopsy specimens can be obtained from other organs. In addition, an advantage to performing a biopsy of an involved organ (eg, kidney, heart) is that it definitively establishes a cause-and-effect relationship between the organ dysfunction and amyloid deposition. Synovial fluid may contain amyloid fibrils, although it is not particularly inflammatory, with white blood cell counts on average less than 2000 cells/µL. Synovial biopsies reveal marked synovial villi hypertrophy. The classic “shoulder-pad” sign denotes end-stage amyloid deposits in the shoulder synovium and periarticular structures, but is rarely seen. Radiography may reveal irregularly shaped hyperlucencies, subchondral cysts, and erosions that will correspond with low-intensity signals on both T1 and T2 MRIs. Ultrasound investigations may also show lucencies, soft-tissue changes, power Doppler changes, increased thickness of tendons, and joint effusions with echogenic zones. Up to 5% of patients with long-standing RA can develop systemic amyloidosis that usually presents as nephrotic syndrome. Genetic study can predict certain haplotypes that can increase the risk of developing amyloidosis by 7 times. The hope is that this increase in the understanding of haplotypes and proteomics will lead to more specific therapies. Patisiran (Onpattro) was the first drug approved by the US Food and Drug Administration (FDA), in August 2018, for treatment of polyneuropathy caused by hereditary transthyretin-mediated amyloidosis (hATTR) in adults. The first of a new class of targeted RNA-based therapies, patisiran acts by using RNA to interfere with the production of mutant transthyretin (TTR) protein, thereby reducing serum TTR protein levels and TTR protein deposits in tissues. It is administered by intravenous (IV) infusion every 3 weeks. Inotersen (Tegsedi) was approved by the FDA in October 2018. Like patisiran, it is indicated for polyneuropathy of hATTR in adults; unlike patisiran, inotersen is given as a once-weekly subcutaneous injection that the patient or caregiver can administer. It is an antisense oligonucleotide that causes degradation of mutant and wild-type transthyretin mRNA by binding TTR mRNA. This action results in reduced TTR protein levels in serum and tissue. Aβ immunotherapies have shown some promise in the treatment of Alzheimer disease. Agents with great potential include the passive monoclonal antibodies bapineuzumab  and solanezumab. However, both of these humanized monoclonal antibodies have failed to provide meaningful cognitive changes in clinical trials. Further studies using this strategy are ongoing. Gantenerumab is the first fully human monoclonal antibody that binds regions of Aβ configuration not present in the structure of the native monomeric Aβ. Therefore, gantenerumab preferentially binds to aggregated Aβ. Phase II and III clinical trials have shown disease-modifying potential in Alzheimer disease, with reductions in brain amyloid as measured by carbon 11 [11 C]–labeled Pittsburgh compound B PET but no meaningful neurocognitive improvements. Interestingly, “live-cell imaging indicated that a clearance of fluorescent-labeled gantenerumab bound to amyloid deposits occurred in a dose-dependent manner within hours via active intracellular uptake by brain-activated microglia adjacent to amyloid plaques.”  This approach may continue to yield more clinically significant results in the future. A phase II, open-label, single-treatment arm evaluated the pharmacodynamics, efficacy, and safety of tafamidis in patients with non-Val30Met transthyretin (TTR) amyloidosis. Twenty-one patients with 8 different non-Val30Met mutations received daily oral tafamidis, and many experienced improved quality of life measures, while pro-BNP and echocardiographic features improved. Another study showed that long-term use continued to stabilize TTR at 30 months. In a cross-over scheme, patients previously have given placebo were able to slow their neurologic decline, proving that earlier treatment is better. The success of tafamidis in a subset of amyloidosis is very encouraging for future molecular targets. A subset of patients with amyloidosis (AA) in the setting of arthritis were monitored for benefits from the IL-6 receptor antibody tocilizumab. After a year of therapy with the standard regimen for rheumatoid arthritis (RA) (8 mg/kg q4wk) a significant reduction in renal dysfunction, serum AA concentration, and urinary protein secretion was observed in conjunction with reduced disease activity. These patients had been previously treated with etanercept without these benefits. This study again highlights the importance of treating the underlying condition, but certain biologic targets may have more downstream effects on amyloidogenesis. Other innovative medicines have been developed to block hepatic production of both mutant and wild type TTR (noxious in late-onset forms of NAH after age 50 y), and to remove amyloid deposits (monoclonal anti-SAP). Clinical trials should first include patients with late-onset FAP or non-met30 TTR familial amyloid polyneuropathy who are less responsive to LT7 and patients in whom tafamidis is ineffective or inappropriate. Initial and periodic cardiac assessment is necessary, as cardiac impairment is inevitable and largely responsible for mortality. Symptomatic treatment is crucial to improve these patients' quality of life. Autologous stem-cell transplantation (ASCT) has been used in patients with AL amyloidosis. Initially, high rates of early mortality raised concern about the safety of ASCT in this setting, but a study of Mayo Clinic patients found that treatment-related mortality declined from 14.5% in 1996-2002 to 2.4% in 2010-2016 (P < 0.001). Median overall survival for those periods increased from 75 months to not reached. Hematologic response rates rose from 69% to 84%. The authors conclude that ASCT is likely to remain an important first-line treatment, even when novel agents become available. While amyloidosis is a very heterogeneous disease, there has been a focused effort to define what a meaningful response to therapy looks like. Each affected organ can be measured over time. Symptomatic care in amyloidosis is paramount, given the limited targeted therapeutics. Certain organ-specific types of amyloid are beginning to have standards of supportive care. Certain medications such as digoxin or calcium channel blockers are dangerous to the already-hindered conduction system in cardiac amyloid. What are amyloid fibrils and how do they cause amyloidosis? What are the historical classification systems of amyloidosis? How is amyloidosis classified biochemically? What is A amyloidosis (AA)? How is A amyloidosis (AA) treated? How is light chain amyloidosis (AL) diagnosed and treated? What is heavy chain amyloidosis (AH)? How is transthyretin amyloidosis diagnosed and treated? How is beta2-microglobulin amyloidosis (Abeta2M) diagnosed and treated? What are the types of cryopyrin-associated periodic syndrome (CAPS)? How is cryopyrin-associated periodic syndrome (CAPS) diagnosed and treated? What is Muckle-Wells syndrome (MWS)? What is apolipoprotein AI amyloidosis (apoAI)? What is fibrinogen amyloidosis (AFib)? What is lysozyme amyloidosis (ALys)? What is apolipoprotein AII amyloidosis (AapoAII)? What is beta protein amyloid (A)? What is prion protein amyloidosis (APrP)? What is cystatin C amyloidosis (ACys)? What is non-amyloid beta cerebral amyloidosis (chromosome 13 dementias)? What is atrial natriuretic factor amyloidosis? What is keratoepithelin amyloidosis and lactoferrin amyloidosis? What is calcitonin amyloid (Acal)? What is islet amyloid polypeptide (IAPP) amyloidosis? What is prolactin amyloid (Apro)? What is the role of nonfibrillar components of amyloid in amyloidosis? What is the pentagonal (P) component of amyloid? What is the role of apolipoprotein E (apoE) in amyloid formation? What is the role of glycosaminoglycans (GAGs) in the development of amyloidosis? What is the role of amyloid protein structures in the pathogenesis of amyloidosis? What is location of deposits in amyloidosis? What is the role of proteolysis in the pathogenesis of amyloidosis? Which immunocytochemical studies are performed in the diagnosis of amyloidosis? What is the role of rectal biopsy in the diagnosis of amyloidosis? What is the role of organ biopsies in the diagnosis of amyloidosis? What is the role of imaging in the diagnosis of amyloidosis? What is the role of radiography in the diagnosis of amyloid arthropathy? What is the incidence of amyloidosis? What is the role of beta-2m-adsorbing columns in the treatment of dialysis-related amyloidosis? What is the role of immunotherapy in the treatment of amyloidosis? What is the role of RNA-based therapies in the treatment of amyloidosis? What is the role of doxycycline in the treatment of amyloidosis? What is the role of gantenerumab in the treatment of amyloidosis? What is the role of tafamidis in the treatment of amyloidosis? What is the role of tocilizumab in the treatment of amyloidosis? What is the role of bortezomib in the treatment of amyloidosis? Which innovative medications have been developed for the treatment of amyloidosis? What is the role of autologous stem-cell transplantation (ASCT) in the treatment of amyloidosis? How is the response to therapy defined for amyloidosis? How can supportive care for amyloidosis vary? What are considerations regarding drug therapy for amyloidosis? What is included in supportive care for amyloidosis? Chuang E, Hori AM, Hesketh CD, Shorter J. Amyloid assembly and disassembly. J Cell Sci. 2018 Apr 13. 131 (8):86-90. [Medline]. [Full Text]. Chiti F, Dobson CM. Protein misfolding, functional amyloid, and human disease. Annu Rev Biochem. 2006. 75:333-66. [Medline]. Fandrich M, Meinhardt J, Grigorieff N. Structural polymorphism of Alzheimer Abeta and other amyloid fibrils. Prion. 2009 Apr-Jun. 3(2):89-93. [Medline]. [Full Text]. Fandrich M. On the structural definition of amyloid fibrils and other polypeptide aggregates. Cell Mol Life Sci. 2007 Aug. 64(16):2066-78. [Medline]. Westermark P, Benson MD, Buxbaum JN, Cohen AS, Frangione B, Ikeda S, et al. A primer of amyloid nomenclature. Amyloid. 2007 Sep. 14(3):179-83. [Medline]. Buxbaum JN. The systemic amyloidoses. Curr Opin Rheumatol. 2004 Jan. 16(1):67-75. [Medline]. Ando Y, Ueda M. Novel methods for detecting amyloidogenic proteins in transthyretin related amyloidosis. Front Biosci. 2008. 13:5548-58. [Medline]. Hazenberg BP. Amyloidosis: a clinical overview. Rheum Dis Clin North Am. 2013 May. 39(2):323-45. [Medline]. Buck FS, Koss MN, Sherrod AE, Wu A, Takahashi M. Ethnic distribution of amyloidosis: an autopsy study. Mod Pathol. 1989 Jul. 2(4):372-7. [Medline]. Shin JK, Jung YH, Bae MN, Baek IW, Kim KJ, Cho CS. Successful treatment of protein-losing enteropathy due to AA amyloidosis with octreotide in a patient with rheumatoid arthritis. Mod Rheumatol. 2013 Mar. 23(2):406-11. [Medline]. Tam JH, Pasternak SH. Amyloid and Alzheimer's disease: inside and out. Can J Neurol Sci. 2012 May. 39(3):286-98. [Medline]. Basha HI, Raj E, Bachuwa G. Cardiac amyloidosis masquerading as biventricular hypertrophy in a patient with multiple myeloma. BMJ Case Rep. 2013 Jul 29. 2013:[Medline]. Saha A, Chopra Y, Theis JD, Vrana JA, Sethi S. AA amyloidosis associated with systemic-onset juvenile idiopathic arthritis. Am J Kidney Dis. 2013 Oct. 62(4):834-8. [Medline]. Cammelli D. [Extra-articular manifestations of seronegative spondylarthritis]. Recenti Prog Med. 2006 May. 97(5):280-9. [Medline]. Bergis M, Dega H, Planquois V, Benichou O, Dubertret L. [Amyloidosis complicating psoriatic arthritis]. Ann Dermatol Venereol. 2003 Nov. 130(11):1039-42. [Medline]. Kishida D, Okuda Y, Onishi M, Takebayashi M, Matoba K, Jouyama K. Successful tocilizumab treatment in a patient with adult-onset Still's disease complicated by chronic active hepatitis B and amyloid A amyloidosis. Mod Rheumatol. 2011 Apr. 21(2):215-8. [Medline]. Erten S, Perçinel S, Olmez U, Ensari A, Düzgün N. Behçet's disease associated with diarrhea and secondary amyloidosis. Turk J Gastroenterol. 2011 Feb. 22(1):106-7. [Medline]. Lane T, Loeffler JM, Rowczenio DM, Gilbertson JA, Bybee A, Russell TL. AA amyloidosis complicating the hereditary periodic fever syndromes. Arthritis Rheum. 2013 Apr. 65(4):1116-21. [Medline]. Denis MA, Cosyns JP, Persu A, Dewit O, de Galocsy C, Hoang P. Control of AA amyloidosis complicating Crohn's disease: a clinico-pathological study. Eur J Clin Invest. 2013 Mar. 43(3):292-301. [Medline]. Silva Júnior GB, Barbosa OA, Barros Rde M, Carvalho Pdos R, Mendoza TR, Barreto DM. [Amyloidosis and end-stage renal disease associated with leprosy]. Rev Soc Bras Med Trop. 2010 Jul-Aug. 43(4):474-6. [Medline]. Neugebauer C, Graf R. [Expert opinion problems in the evaluation of osteomyelitis]. Orthopade. 2004 May. 33(5):603-11; quiz 612. [Medline]. Lekpa FK, Ndongo S, Pouye A, Tiendrebeogo JW, Ndao AC, Ka MM. [Amyloidosis in sub-Saharan Africa]. Med Sante Trop. 2012 Jul-Sep. 22(3):275-8. [Medline]. Akçay S, Akman B, Ozdemir H, Eyüboglu FO, Karacan O, Ozdemir N. Bronchiectasis-related amyloidosis as a cause of chronic renal failure. Ren Fail. 2002 Nov. 24(6):815-23. [Medline]. Caro-Cuenca MT, Ortega-Salas R, Espinosa-Hernández M. Renal AA amyloidosis in a Castleman's disease patient. Nefrologia. 2012. 32(5):699-700. [Medline]. Caro-Cuenca MT, Ortega-Salas R, Espinosa-Hernández M. Renal AA amyloidosis in a Castleman's disease patient. Blood. 2013 Jul 18. 122(3):458-9. [Medline]. Nobata H, Suga N, Itoh A, Miura N, Kitagawa W, Morita H, et al. Systemic AA amyloidosis in a patient with lung metastasis from renal cell carcinoma. Amyloid. 2012 Dec. 19(4):197-200. [Medline]. Rivera R, Kaul V, DeCross A, Whitney-Miller C. Primary gastric amyloidosis presenting as an isolated gastric mass. Gastrointest Endosc. 2012 Jul. 76(1):186-7. [Medline]. Yokota S, Kikuchi M, Nozawa T, Kizawa T, Kanetaka T, Miyamae T, et al. [An approach to the patients with cryopyrin-associated periodic syndrome (CAPS) : a new biologic response modifier, canakinumab]. Nihon Rinsho Meneki Gakkai Kaishi. 2012. 35(1):23-9. [Medline]. Smith GR, Tymms KE, Falk M. Etanercept treatment of renal amyloidosis complicating rheumatoid arthritis. Intern Med J. 2004 Sep-Oct. 34(9-10):570-2. [Medline]. Miyagawa I, Nakayamada S, Saito K, Hanami K, Nawata M, Sawamukai N. Study on the safety and efficacy of tocilizumab, an anti-IL-6 receptor antibody, in patients with rheumatoid arthritis complicated with AA amyloidosis. Mod Rheumatol. 2013 Oct 21. [Medline]. Nakamura T, Higashi S, Tomoda K, Tsukano M, Baba S. Efficacy of etanercept in patients with AA amyloidosis secondary to rheumatoid arthritis. Clin Exp Rheumatol. 2007 Jul-Aug. 25(4):518-22. [Medline]. Okuda Y, Ohnishi M, Matoba K, Jouyama K, Yamada A, Sawada N, et al. Comparison of the clinical utility of tocilizumab and anti-TNF therapy in AA amyloidosis complicating rheumatic diseases. Mod Rheumatol. 2014 Jan. 24(1):137-43. [Medline]. Ducret A, Bruun CF, Bures EJ, Marhaug G, Husby G, Aebersold R. Characterization of human serum amyloid A protein isoforms separated by two-dimensional electrophoresis by liquid chromatography/electrospray ionization tandem mass spectrometry. Electrophoresis. 1996 May. 17(5):866-76. [Medline]. Nakamura T. Clinical strategies for amyloid A amyloidosis secondary to rheumatoid arthritis. Mod Rheumatol. 2008. 18(2):109-18. [Medline]. Lane T, Loeffler JM, Rowczenio DM, Gilbertson JA, Bybee A, Russell TL, et al. AA amyloidosis complicating the hereditary periodic fever syndromes. Arthritis Rheum. 2013 Apr. 65(4):1116-21. [Medline]. Merlini G, Seldin DC, Gertz MA. Amyloidosis: pathogenesis and new therapeutic options. J Clin Oncol. 2011 May 10. 29(14):1924-33. [Medline]. Sissoko M, Sanchorawala V, Seldin D, Sworder B, Angelino K, Broce M, et al. Clinical presentation and treatment responses in IgM-related AL amyloidosis. Amyloid. 2015. 22 (4):229-35. [Medline]. Reece DE, Hegenbart U, Sanchorawala V, et al. Weekly and twice-weekly bortezomib in AL amyloidosis: Results of a phase II study. J Clin Oncol. 2010. 28:578s. Wechalekar AD, Goodman HJ, Lachmann HJ, Offer M, Hawkins PN, Gillmore JD. Safety and efficacy of risk-adapted cyclophosphamide, thalidomide, and dexamethasone in systemic AL amyloidosis. Blood. 2007 Jan 15. 109(2):457-64. [Medline]. Kastritis E, Anagnostopoulos A, Roussou M, Toumanidis S, Pamboukas C, Migkou M, et al. Treatment of light chain (AL) amyloidosis with the combination of bortezomib and dexamethasone. Haematologica. 2007 Oct. 92(10):1351-8. [Medline]. Sitia R, Palladini G, Merlini G. Bortezomib in the treatment of AL amyloidosis: targeted therapy?. Haematologica. 2007 Oct. 92(10):1302-7. [Medline]. Dispenzieri A, Gertz MA, Hayman SR, et al. A phase II study of pomalidomide and dexamethasone in previously treated light-chain (AL) amyloidosis. J Clin Oncol. 2010. 28:579s. Picken MM. Immunoglobulin light and heavy chain amyloidosis AL/AH: renal pathology and differential diagnosis. Contrib Nephrol. 2007. 153:135-55. [Medline]. Connors LH, Sam F, Skinner M, Salinaro F, Sun F, Ruberg FL, et al. Heart Failure Resulting From Age-Related Cardiac Amyloid Disease Associated With Wild-Type Transthyretin: A Prospective, Observational Cohort Study. Circulation. 2016 Jan 19. 133 (3):282-90. [Medline]. Planté-Bordeneuve V. [The diagnosis and management of familial amyloid polyneuropathy]. Rev Neurol (Paris). 2006 Nov. 162(11):1138-46. [Medline]. Gonzalez-Duarte A. Autonomic involvement in hereditary transthyretin amyloidosis (hATTR amyloidosis). Clin Auton Res. 2018 Mar 6. [Medline]. Floege J, Bartsch A, Schulze M, Shaldon S, Koch KM, Smeby LC. Clearance and synthesis rates of beta 2-microglobulin in patients undergoing hemodialysis and in normal subjects. J Lab Clin Med. 1991 Aug. 118(2):153-65. [Medline]. Otsubo S, Kimata N, Okutsu I, Oshikawa K, Ueda S, Sugimoto H, et al. Characteristics of dialysis-related amyloidosis in patients on haemodialysis therapy for more than 30 years. Nephrol Dial Transplant. 2009 May. 24(5):1593-8. [Medline]. Traut M, Haufe CC, Eismann U, Deppisch RM, Stein G, Wolf G. Increased binding of beta-2-microglobulin to blood cells in dialysis patients treated with high-flux dialyzers compared with low-flux membranes contributed to reduced beta-2-microglobulin concentrations. Results of a cross-over study. Blood Purif. 2007. 25(5-6):432-40. [Medline]. Schenk D. Amyloid-beta immunotherapy for Alzheimer's disease: the end of the beginning. Nat Rev Neurosci. 2002 Oct. 3(10):824-8. [Medline]. Hoffman HM, Mueller JL, Broide DH, Wanderer AA, Kolodner RD. Mutation of a new gene encoding a putative pyrin-like protein causes familial cold autoinflammatory syndrome and Muckle-Wells syndrome. Nat Genet. 2001 Nov. 29(3):301-5. [Medline]. Dinarello CA. Unraveling the NALP-3/IL-1beta inflammasome: a big lesson from a small mutation. Immunity. 2004 Mar. 20(3):243-4. [Medline]. van der Hilst JC, Simon A, Drenth JP. Hereditary periodic fever and reactive amyloidosis. Clin Exp Med. 2005 Oct. 5(3):87-98. [Medline]. Hawkins PN, Lachmann HJ, Aganna E, McDermott MF. Spectrum of clinical features in Muckle-Wells syndrome and response to anakinra. Arthritis Rheum. 2004 Feb. 50(2):607-12. [Medline]. Goldbach-Mansky R, Dailey NJ, Canna SW, Gelabert A, Jones J, Rubin BI. Neonatal-onset multisystem inflammatory disease responsive to interleukin-1beta inhibition. N Engl J Med. 2006 Aug 10. 355(6):581-92. [Medline]. Hoffman HM, Throne ML, Amar NJ, Sebai M, Kivitz AJ, Kavanaugh A, et al. Efficacy and safety of rilonacept (interleukin-1 Trap) in patients with cryopyrin-associated periodic syndromes: results from two sequential placebo-controlled studies. Arthritis Rheum. 2008 Aug. 58(8):2443-52. [Medline]. Stew BT, Fishpool SJ, Owens D, Quine S. Muckle-Wells syndrome: a treatable cause of congenital sensorineural hearing loss. B-ENT. 2013. 9(2):161-3. [Medline]. Yamazaki T, Masumoto J, Agematsu K, Sawai N, Kobayashi S, Shigemura T, et al. Anakinra improves sensory deafness in a Japanese patient with Muckle-Wells syndrome, possibly by inhibiting the cryopyrin inflammasome. Arthritis Rheum. 2008 Mar. 58(3):864-8. [Medline]. Granel B, Valleix S, Serratrice J, Chérin P, Texeira A, Disdier P, et al. Lysozyme amyloidosis: report of 4 cases and a review of the literature. Medicine (Baltimore). 2006 Jan. 85(1):66-73. [Medline]. Picken MM, Linke RP. Nephrotic syndrome due to an amyloidogenic mutation in fibrinogen A alpha chain. J Am Soc Nephrol. 2009 Aug. 20(8):1681-5. [Medline]. Eriksson M, Schönland S, Yumlu S, Hegenbart U, von Hutten H, Gioeva Z, et al. Hereditary apolipoprotein AI-associated amyloidosis in surgical pathology specimens: identification of three novel mutations in the APOA1 gene. J Mol Diagn. 2009 May. 11(3):257-62. [Medline]. [Full Text]. Boche D, Zotova E, Weller RO, Love S, Neal JW, Pickering RM, et al. Consequence of Abeta immunization on the vasculature of human Alzheimer's disease brain. Brain. 2008 Dec. 131:3299-310. [Medline]. Cohen SI, Linse S, Luheshi LM, Hellstrand E, White DA, Rajah L. Proliferation of amyloid-ß42 aggregates occurs through a secondary nucleation mechanism. Proc Natl Acad Sci U S A. 2013 Jun 11. 110(24):9758-63. [Medline]. Emily M, Talvas A, Delamarche C. MetAmyl: a METa-predictor for AMYLoid proteins. PLoS One. 2013. 8(11):e79722. [Medline]. [Full Text]. Rezaei H. Prion protein oligomerization. Curr Alzheimer Res. 2008 Dec. 5(6):572-8. [Medline]. Solomon JP, Page LJ, Balch WE, Kelly JW. Gelsolin amyloidosis: genetics, biochemistry, pathology and possible strategies for therapeutic intervention. Crit Rev Biochem Mol Biol. 2012 May-Jun. 47(3):282-96. [Medline]. Chen CD, Huff ME, Matteson J, Page L, Phillips R, Kelly JW. Furin initiates gelsolin familial amyloidosis in the Golgi through a defect in Ca(2+) stabilization. EMBO J. 2001 Nov 15. 20(22):6277-87. [Medline]. Chiti F, Stefani M, Taddei N, Ramponi G, Dobson CM. Rationalization of the effects of mutations on peptide and protein aggregation rates. Nature. 2003 Aug 14. 424(6950):805-8. [Medline]. Kangas H, Paunio T, Kalkkinen N, Jalanko A, Peltonen L. In vitro expression analysis shows that the secretory form of gelsolin is the sole source of amyloid in gelsolin-related amyloidosis. Hum Mol Genet. 1996 Sep. 5(9):1237-43. [Medline]. Ida CM, Yan X, Jentoft ME, Kip NS, Scheithauer BW, Morris JM. Pituicytoma with gelsolin amyloid deposition. Endocr Pathol. 2013 Sep. 24(3):149-55. [Medline]. Choe H, Burtnick LD, Mejillano M, Yin HL, Robinson RC, Choe S. The calcium activation of gelsolin: insights from the 3A structure of the G4-G6/actin complex. J Mol Biol. 2002 Dec 6. 324(4):691-702. [Medline]. Huff ME, Page LJ, Balch WE, Kelly JW. Gelsolin domain 2 Ca2+ affinity determines susceptibility to furin proteolysis and familial amyloidosis of finnish type. J Mol Biol. 2003 Nov 14. 334(1):119-27. [Medline]. Haverland N, Pottiez G, Wiederin J, Ciborowski P. Immunoreactivity of anti-gelsolin antibodies: implications for biomarker validation. J Transl Med. 2010 Dec 20. 8:137. [Medline]. [Full Text]. Podduturi V, Armstrong DR, Hitchcock MA, Roberts WC, Guileyardo JM. Isolated atrial amyloidosis and the importance of molecular classification. Proc (Bayl Univ Med Cent). 2013 Oct. 26(4):387-9. [Medline]. [Full Text]. Abedini A, Schmidt AM. Mechanisms of islet amyloidosis toxicity in type 2 diabetes. FEBS Lett. 2013 Apr 17. 587(8):1119-27. [Medline]. Levine SN, Ishaq S, Nanda A, Wilson JD, Gonzalez-Toledo E. Occurrence of extensive spherical amyloid deposits in a prolactin-secreting pituitary macroadenoma: a radiologic-pathologic correlation. Ann Diagn Pathol. 2013 Aug. 17(4):361-6. [Medline]. Wenson SF, Jessup CJ, Johnson MM, Cohen LM, Mahmoodi M. Primary cutaneous amyloidosis of the external ear: a clinicopathological and immunohistochemical study of 17 cases. J Cutan Pathol. 2012 Feb. 39(2):263-9. [Medline]. Kebbel A, Röcken C. Immunohistochemical classification of amyloid in surgical pathology revisited. Am J Surg Pathol. 2006 Jun. 30(6):673-83. [Medline]. Rao M, Lamont JL, Chan J, Concannon TW, Comenzo R, Ratichek SJ, et al. Serum Free Light Chain Analysis for the Diagnosis, Management, and Prognosis of Plasma Cell Dyscrasias: Future Research Needs: Identification of Future Research Needs From Comparative Effectiveness Review No. 73 [Internet]. 2012 Sep. [Medline]. West S, Singleton JD. Rheumatology Secrets. 2nd ed. Philadelpha, PA: Hanley and Belfus; 2003. 519. Thiene G, Bruneval P, Veinot J, Leone O. Diagnostic use of the endomyocardial biopsy: a consensus statement. Virchows Arch. 2013 Jul. 463(1):1-5. [Medline]. Yilmaz M, Unsal A, Sokmen M, Harmankaya O, Alkim C, Kabukcuoglu F, et al. Duodenal biopsy for diagnosis of renal involvement in amyloidosis. Clin Nephrol. 2012 Feb. 77(2):114-8. [Medline]. Castaño A, Bokhari S, Brannagan TH 3rd, Wynn J, Maurer MS. Technetium pyrophosphate myocardial uptake and peripheral neuropathy in a rare variant of familial transthyretin (TTR) amyloidosis (Ser23Asn): a case report and literature review. Amyloid. 2012 Mar. 19(1):41-6. [Medline]. Bokhari S, Castaño A, Pozniakoff T, Deslisle S, Latif F, Maurer MS. (99m)Tc-pyrophosphate scintigraphy for differentiating light-chain cardiac amyloidosis from the transthyretin-related familial and senile cardiac amyloidoses. Circ Cardiovasc Imaging. 2013 Mar 1. 6(2):195-201. [Medline]. Vandenberghe R, Adamczuk K, Dupont P, Laere KV, Chételat G. Amyloid PET in clinical practice: Its place in the multidimensional space of Alzheimer's disease. Neuroimage Clin. 2013. 2:497-511. [Medline]. M'bappé P, Grateau G. Osteo-articular manifestations of amyloidosis. Best Pract Res Clin Rheumatol. 2012 Aug. 26(4):459-75. [Medline]. Husby G. Amyloidosis and rheumatoid arthritis. Clin Exp Rheumatol. 1985 Apr-Jun. 3(2):173-80. [Medline]. Koivuniemi R, Paimela L, Suomalainen R, Tornroth T, Leirisalo-Repo M. Amyloidosis is frequently undetected in patients with rheumatoid arthritis. Amyloid. 2008 Dec. 15(4):262-8. [Medline]. West S, Singleton J. Rheumatology Secrets. 2nd ed. Philadelphia, PA: Hanley and Belfus; 2003. 77; 517. Kyle RA, Eilers SG, Linscheid RL, Gaffey TA. Amyloid localized to tenosynovium at carpal tunnel release. Natural history of 124 cases. Am J Clin Pathol. 1989 Apr. 91(4):393-7. [Medline]. Katoh N, Tazawa K, Ishii W, Matsuda M, Ikeda S. Systemic AL amyloidosis mimicking rheumatoid arthritis. Intern Med. 2008. 47(12):1133-8. [Medline]. Immonen K, Finne P. Grönhagen-Riska C, Pettersson T, Klaukka T, Kautiainen H, Hakala M. A marked decline in the incidence of renal replacement therapy for amyloidosis associated with inflammatory rheumatic diseases. Amyloid. 2011. 18:25. Immonen K, Finne P, Hakala M, Kautiainen H, Pettersson T, Grönhagen-Riska C. No improvement in survival of patients with amyloidosis associated with inflammatory rheumatic diseases -- data from the Finnish national registry for kidney diseases. J Rheumatol. 2008 Jul. 35(7):1334-8. [Medline]. Abdallah E, Waked E. Incidence and clinical outcome of renal amyloidosis: a retrospective study. Saudi J Kidney Dis Transpl. 2013 Sep. 24(5):950-8. [Medline]. Jung O, Haack HS, Brodt HR, Grützmacher P, Geiger H, Amann K. [Changing spectrum of renal disease in HIV infection]. Dtsch Med Wochenschr. 2013 Sep. 138(38):1887-91. [Medline]. Adams D, Gonzalez-Duarte A, O'Riordan WD, Yang CC, Ueda M, Kristen AV, et al. Patisiran, an RNAi Therapeutic, for Hereditary Transthyretin Amyloidosis. N Engl J Med. 2018 Jul 5. 379 (1):11-21. [Medline]. Montagna G, Cazzulani B, Obici L, Uggetti C, Giorgetti S, Porcari R. Benefit of doxycycline treatment on articular disability caused by dialysis related amyloidosis. Amyloid. 2013 Sep. 20(3):173-8. [Medline]. Yamamoto Y, Hirawa N, Yamaguchi S, Ogawa N, Takeda H, Shibuya K, et al. Long-term efficacy and safety of the small-sized ß2-microglobulin adsorption column for dialysis-related amyloidosis. Ther Apher Dial. 2011 Oct. 15(5):466-74. [Medline]. Senior K. Dosing in phase II trial of Alzheimer's vaccine suspended. Lancet Neurol. 2002 May. 1(1):3. [Medline]. Vellas B, Carrillo MC, Sampaio C, Brashear HR, Siemers E, Hampel H. Designing drug trials for Alzheimer's disease: what we have learned from the release of the phase III antibody trials: a report from the EU/US/CTAD Task Force. Alzheimers Dement. 2013 Jul. 9(4):438-44. [Medline]. Novakovic D, Feligioni M, Scaccianoce S, Caruso A, Piccinin S, Schepisi C, et al. Profile of gantenerumab and its potential in the treatment of Alzheimer's disease. Drug Des Devel Ther. 2013. 7:1359-64. [Medline]. [Full Text]. Giuffrida ML, Caraci F, Pignataro B, Cataldo S, De Bona P, Bruno V, et al. Beta-amyloid monomers are neuroprotective. J Neurosci. 2009 Aug 26. 29(34):10582-7. [Medline]. Bannykh SI, Balch WE, Kelly JW, Page LJ, Shelton GD. Formation of gelsolin amyloid fibrils in the rough endoplasmic reticulum of skeletal muscle in the gelsolin mouse model of inclusion body myositis: comparative analysis to human sporadic inclusion body myositis. Ultrastruct Pathol. 2013 Oct. 37(5):304-11. [Medline]. Merlini G, Planté-Bordeneuve V, Judge DP, Schmidt H, Obici L, Perlini S, et al. Effects of tafamidis on transthyretin stabilization and clinical outcomes in patients with non-Val30Met transthyretin amyloidosis. J Cardiovasc Transl Res. 2013 Dec. 6(6):1011-20. [Medline]. [Full Text]. Coelho T, Maia LF, da Silva AM, Cruz MW, Planté-Bordeneuve V, Suhr OB. Long-term effects of tafamidis for the treatment of transthyretin familial amyloid polyneuropathy. J Neurol. 2013 Nov. 260(11):2802-14. [Medline]. Jiang F, Chen J, Liu H, Li L, Lu W, Fu R. The Effect and Safety of Bortezomib in the Treatment of AL Amyloidosis: A Systematic Review and Meta-Analysis. Indian J Hematol Blood Transfus. 2018 Apr. 34 (2):216-226. [Medline]. Wechalekar AD, Gillmore JD, Hawkins PN. Systemic amyloidosis. Lancet. 2016 Jun 25. 387 (10038):2641-54. [Medline]. Desport E, Bridoux F, Sirac C, Delbes S, Bender S, Fernandez B, et al. Al amyloidosis. Orphanet J Rare Dis. 2012 Aug 21. 7:54. [Medline]. [Full Text]. Selvanayagam JB, Hawkins PN, Paul B, Myerson SG, Neubauer S. Evaluation and management of the cardiac amyloidosis. J Am Coll Cardiol. 2007 Nov 27. 50(22):2101-10. [Medline]. Falk RH, Rubinow A, Cohen AS. Cardiac arrhythmias in systemic amyloidosis: correlation with echocardiographic abnormalities. J Am Coll Cardiol. 1984 Jan. 3(1):107-13. [Medline]. Soni A, LeLorier P. Sudden death in nondilated cardiomyopathies: pathophysiology and prevention. Curr Heart Fail Rep. 2005 Sep. 2(3):118-23. [Medline]. Palladini G, Perfetti V, Obici L, Caccialanza R, Semino A, Adami F. Association of melphalan and high-dose dexamethasone is effective and well tolerated in patients with AL (primary) amyloidosis who are ineligible for stem cell transplantation. Blood. 2004 Apr 15. 103(8):2936-8. [Medline]. Lacy MQ, Dispenzieri A, Hayman SR, Kumar S, Kyle RA, Rajkumar SV. Autologous stem cell transplant after heart transplant for light chain (Al) amyloid cardiomyopathy. J Heart Lung Transplant. 2008 Aug. 27(8):823-9. [Medline]. Kapoor P, Thenappan T, Singh E, Kumar S, Greipp PR. Cardiac amyloidosis: a practical approach to diagnosis and management. Am J Med. 2011 Nov. 124(11):1006-15. [Medline]. Adams D, Suhr OB, Hund E, Obici L, Tournev I, Campistol JM, et al. First European consensus for diagnosis, management, and treatment of transthyretin familial amyloid polyneuropathy. Curr Opin Neurol. 2016 Feb. 29 Suppl 1:S14-26. [Medline]. Zelichowski G, Lubas A, Wankowicz Z. [Advances in diagnosis and treatment of AL amyloidosis]. Pol Merkur Lekarski. 2008 Apr. 24(142):340-5. [Medline]. Adams D, Cauquil C, Théaudin M. [Familial amyloid polyneuropathies: therapeutic issues]. Bull Acad Natl Med. 2012 Oct. 196(7):1333-45; discussion 1345-7. [Medline]. Eklund KK. Mast cells in the pathogenesis of rheumatic diseases and as potential targets for anti-rheumatic therapy. Immunol Rev. 2007 Jun. 217:38-52. [Medline]. Granel B, Valleix S, Serratrice J, Chérin P, Texeira A, Disdier P. Lysozyme amyloidosis: report of 4 cases and a review of the literature. Medicine (Baltimore). 2006 Jan. 85(1):66-73. [Medline]. Immonen K, Finne P, Grönhagen-Riska C, Pettersson T, Klaukka T, Kautiainen H, et al. A marked decline in the incidence of renal replacement therapy for amyloidosis associated with inflammatory rheumatic diseases - data from nationwide registries in Finland. Amyloid. 2011 Mar. 18(1):25-8. [Medline]. Nobata H, Suga N, Itoh A, Miura N, Kitagawa W, Morita H. Systemic AA amyloidosis in a patient with lung metastasis from renal cell carcinoma. Amyloid. 2012 Dec. 19(4):197-200. [Medline]. Pepys MB. Amyloidosis. Annu Rev Med. 2006. 57:223-41. [Medline]. Rostagno A, Tomidokoro Y, Lashley T, Ng D, Plant G, Holton J. Chromosome 13 dementias. Cell Mol Life Sci. 2005 Aug. 62(16):1814-25. [Medline]. Wechalekar AD, Merlini G, Gillmore JD, et al. N-terminal fragment of brain natriuretic peptide (NT-ProBNP): A new response criterion in AL amyloidosis. Amyloid. 2010. 17:84. West S, Elliot JR, O’Dell JM. Rheumatology Secrets. Philadelpha, PA: Hanley and Belfus; 2003. 2nd ed: 126. Sidiqi MH, Aljama MA, Buadi FK, Warsame RM, Lacy MQ, Dispenzieri A, et al. Stem Cell Transplantation for Light Chain Amyloidosis: Decreased Early Mortality Over Time. J Clin Oncol. 2018 Mar 20. JCO2017769554. [Medline]. Benson MD, Waddington-Cruz M, Berk JL, Polydefkis M, Dyck PJ, Wang AK, et al. Inotersen Treatment for Patients with Hereditary Transthyretin Amyloidosis. N Engl J Med. 2018 Jul 5. 379 (1):22-31. [Medline]. Disclosure: Stock ownership for: Johnson & Johnson. The views expressed in this article are those of the authors and do not reflect the official policy of the Department of Army, Department of Navy, Department of Defense, or US Government.